You may think we have gone mad, as links are still a key factor that Google uses to determine authority of websites and hence increased visibility in the search engines. So hear us out and you will see why we are taking the stance that we are no longer building any links for our current and future clients. This post is designed to be an open & honest discussion with businesses who will have likely heard about ‘Link building’ and want to focus on this activity to increase traffic to their website through Search Engine Optimisation work. A lot has changed over the recent years and below we will run through how outreach & promotion needs to run in the modern age. As you can imagine with working on a lot of Search Engine Optimisation campaigns, we naturally look at a lot of different websites and what websites are mentioning other websites online. This certainly does make you realise just how many weird and wonderful websites there are on the internet. Approaches often taken for link building included identifying relevant websites, drop the webmaster an email to see if they would be interested in linking to ‘Website X’. This, as you can imagine, has an extremely low response rate as people simply hit the ‘Delete’ button as they receive hundreds of requests like this every month. For any website owners who do respond, they are often clued up about the real reason why they are being contacted. For a link, for Search Engine Optimisation purposes. Different industries are savvier than others, with the travel industry being extremely savvy to this. The general response would be along the lines of “That’s nice, here is what we charge to place a link on our website” – which isn’t a good approach to take. This falls into the paid links category which is against Google’s guidelines and can lead to your website being penalised and removed from the search results. It is clear that in a lot of industries the websites that are linking out to other websites are in the main, well…horrible. They aren’t going to be driving any referral traffic and they are purely there for Search Engine Optimisation reasons only. The more websites we review the more we have been seeing this trend over the last couple of years. It has reached the point now whereby the quality websites are few and far between and simply aren’t interested in just linking to a website because they have received an email from the website owner. In summary, the more traditional competitor link analysis and link building approaches that we do, the more challenging it is becoming to achieve good results. Too many websites simply aren’t good enough quality nor are they on-brand. This is not a good way to be spending time as the results to come from this work take far too long to come through. On the client/business side, it is clear that there is a huge gap in knowledge about outreach & promotion and how it relates to Search Engine Optimisation. Hence the reason for this blog post to help to bridge that knowledge gap and educate businesses as to what is needed to compete in a modern age. Hopefully this blog post can be a resource for businesses to look at to understand in more detail about why traditional ‘link building’ isn’t a future proof strategy and how content marketing, outreach & promotion is going to benefit the business. Firstly, let’s take a look at why links are important, how search engines analyse links and what role this plays in modern Search Engine Optimisation work. As a business looking to increase visibility in the search engines you will more than likely have heard about how important links are when it comes to increasing visibility and driving more traffic to your website. Let’s get one thing straight, links are important to both users and search engines. They can drive referral traffic to your website from popular websites which can also lead to a direct increase in revenue as customer purchase your product and services. Search engines analyse links and want the link to be a genuine endorsement from ‘website A’ about ‘website Bs’ products and services. Whether this is talking about said business in the form of press coverage (non-advertorial), a review of the product or service or even official membership from somewhere. Links impact the visibility of your website in the search engines. Various studies have been completed over the years that show how there is a correlation (not causation) between how visible a website is on Google and how many high quality backlinks the website has. 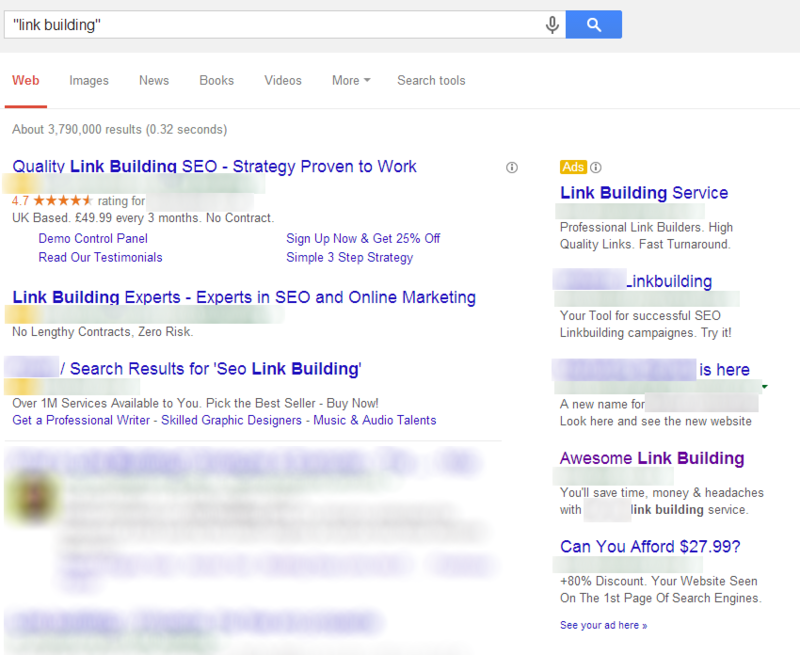 This brings us onto the issue we have with ‘link building’. Correlation does not equal causation. Businesses and website owners should not be chasing links for Search Engine Optimisation purposes. Stop doing this, immediately! Start building relationships with your customers, peers and industry websites so that you earn links. Surely the services at $27.99 are going to be a good investment aren’t they, right? If it seems too good to be true….then it probably is. Businesses paying for ‘link building’ activities that is not integrated with the rest of their businesses are leading to only one thing…a Google penalty for unnatural links. Businesses in highly competitive industries are notorious within digital circles for going down this route and several multi-national well-known brands have received penalties from Google for their activities. This should be a lesson to businesses. Simply ‘building links’ isn’t a good approach to be taking. Websites are owned by real people running real businesses, and they too have the age old question running through their mind WIIFM – What’s in it for me. No-one, no matter how good they claim to be cannot simply go out and ‘build links’ for any business. Sure, it is possible to place links on low quality websites around the web that no-one is ever viewing, but this approach is going to get you penalised by Google, leading to reduced traffic from the search engines. As mentioned earlier, Google continues to crack down on these activities and if your business is relying on Google for a significant part of your revenue, then you have to ask yourself, is this a risk you are willing to take if you get caught out? As a business and website owner, to generate more high quality links to your website, then you need to be doing something worthy of other websites talking about you. It really is as simple as that. Stop trying to manipulate things. We believe so strongly that going out and trying to ‘build links’ for clients is not the best approach to take, that we have taken the stance that we simply aren’t going to help with this. Instead, we are helping businesses to take digital seriously and build a strong brand online through the range of digital marketing services. Let’s take a look at the evidence about how the industry has been moving over the last few years. Not from hearsay, gossip and proposed ‘experts’, but straight from the horse’s mouth. What should I be aware of if I’m considering guest blogging? Answer: Don’t use guest blogging for SEO purposes. Looking at Matt Cutts’ (Head of Web Spam at Google) personal blog titled, the decay and fall of guest blogging for SEO highlights this point even further. Looking around the web, there are always blog posts titled “10 ways to build links” etc. and quite frankly, these are often rather generic and not very useful. Don’t get me wrong here, there can be some interesting tips when looking at the points made, when adapting this to your businesses in the sense of earning links. The reason we have put this blog post together and taken this stance is because we speak with a lot of businesses about Search Engine Optimisation work, and most businesses are still living in the past, 5 years ago, when this type of practice was acceptable. Digital moves fast and as a businesses, to stay ahead you also need to move fast. This includes keeping up with the large shifts in how to market your business online for sustainable growth. Results can be achieved by genuinely making your products and services better along with connecting with your audience and customers. This post is designed to be a wake-up call for businesses to highlight what is needed in the modern era to compete online and to increase traffic from search engines. To reiterate, we aren’t saying we aren’t going to be increasing mentions of client brands and websites online. This is not the case. This is still extremely important for brands to be focusing on, although it is the method of working towards this goal that is changing. If your business isn’t integrating digital into every aspect of work, then you are missing an opportunity to build your brand further online. Find the expertise, knowledge and stories within your business and look to showcase this digitally. Whether this is through blog posts, digital resources or video content for your customers and audience. Building a strong brand online will earn your business links which will help to increase the authority of your website and hence traffic levels. All our focus for clients is on building a strong brand online and linking digital marketing activities together to earn links. No longer can we look at a departmentalised or segmented approach to digital marketing with the aim of increasing popularity on the web. Product / service content: You would be surprised how many websites simply don’t have enough detail about this. Why are your products/services so amazing? Why are they better than competitors? What awards have you won for your work? What are the features and benefits for your customers? How can the product / service fulfil your customers’ needs? Blog content: Talk to your customers about what is happening throughout the business. New member of staff joined? Then talk about what they are there to do. What events have you recently attended? What services have you just launched? How are you making a difference in your local community? How can your customers use your product / service in innovative ways? Don’t just think about the product / service, but think about how customers will use it. Resources: What resources and information will help your customers? Are there any specific files, drawings, guides, calculators, etc. that your customers will find useful? Start to genuinely help customers online by providing resources to help them with what they need. Anyone can sell ‘product x’ – all of the above is what makes your business different to others and hence increase authority on the web. The one thing to take away from this blog post is that we are helping businesses to develop their brand digitally. Quite simply, the industry has moved on very fast and this is what is needed for businesses to compete online today. Some may think this is a strong stance to take, yet we believe strongly that this is the right approach and will ultimately lead to better results. All of the above has been achieved through by expanding relevant and useful content on the website. Not through ‘building links’, but by making the website better for customers by providing additional information that is useful for them. We know this works and we would like to reiterate to businesses that content, along with relevant promotion, needs to be the key focus for building your brand online.